The MEC is a favorite choice to host conferences, banquets, meetings and receptions. Sitting on over 25 acres, we offer a convenient location in the heart of Troy with ample parking for our guests. Our 25,000 square foot facility provides a dramatic lobby looking out to our large outdoor patio, formal dining room, auditorium, and multiple break out rooms. With our leading edge technology and expert service, you can focus on your event, and we’ll take care of the rest. Similarly, our executive food service emphasizes excellence in everything including casual snacks or buffets, plated meals and strolling receptions. Largest Meeting Space: 1,685 sq. 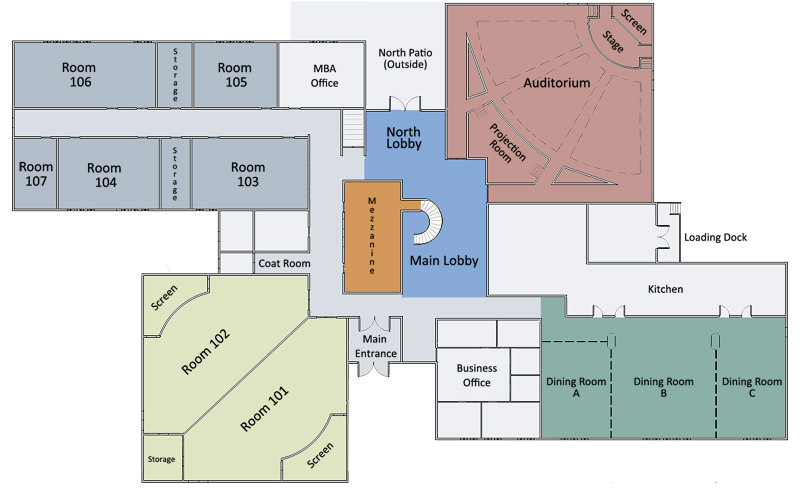 ft.
Auditorium - - - - 400 25 ft.
Amphitheater 102 - 110 - - 110 16 ft.
Room 103 - 37 37 - - 9 ft.
Room 105 - 36 24 - 40 9 ft.
Room 106 - 70 42 - 80 9 ft.
Room 104 - 37 37 - - 9 ft.
North Lobby - - - - - - ft.
Amphitheater 101 - 110 - - 110 - ft.
Executive Boardroom 107 - - 12 - - 9 ft. Dining Room (subdivides into three separate areas) 312 - - 312 - - ft.
Main Lobby - - - - - 38 ft.
Mezzanine - - 100 - - 16 ft.